By November, most vegetable growers in Maine have put their fields to bed and headed indoors to catch up on paperwork and repairs or take a break. A handful of farmers around the state, however, continue through winter, growing a bounty of fresh spinach and salad greens, chard and kale and other cold-hardy crops in high tunnel greenhouses—often without using a drop of fossil fuel for heat. Not so long ago, there were only a handful of people who thought this was possible. “When we started, everyone said it was impossible,” says Eliot Coleman, laughing. “Well, it wasn’t.” Coleman, who has written extensively on organic gardening, pioneered ingenious ways to grow cold-hardy vegetables in the frigid Maine winter by using plastic-covered high tunnel greenhouses heated only by the sun. His approach in a nutshell: grow only cold-hardy crops, plant them in succession in late summer through early fall, and protect them with an inner layer of floating row cover. In 1995, Coleman and his wife—fellow gardening guru Barbara Damrosch—began using these techniques to grow winter crops commercially at Four Season Farm on Cape Rosier, based on years of research and experimentation in their home greenhouse. They’ve been at it ever since, and Coleman has shared his secrets in meticulous detail in his books, including The Winter Harvest Handbook—inspiring farmers around the country and sowing the seeds of a revolution. No one knows precisely how many farms are doing winter production in Maine—estimates run from about a dozen to twenty—but the flowering of this revolution is evident at winter farmers markets around the state. The Maine Federation of Farmers Markets now lists 32 winter markets, a growing number of which are featuring fresh spinach, greens, and other greenhouse crops alongside storage crops such as winter squash, potatoes, and onions. 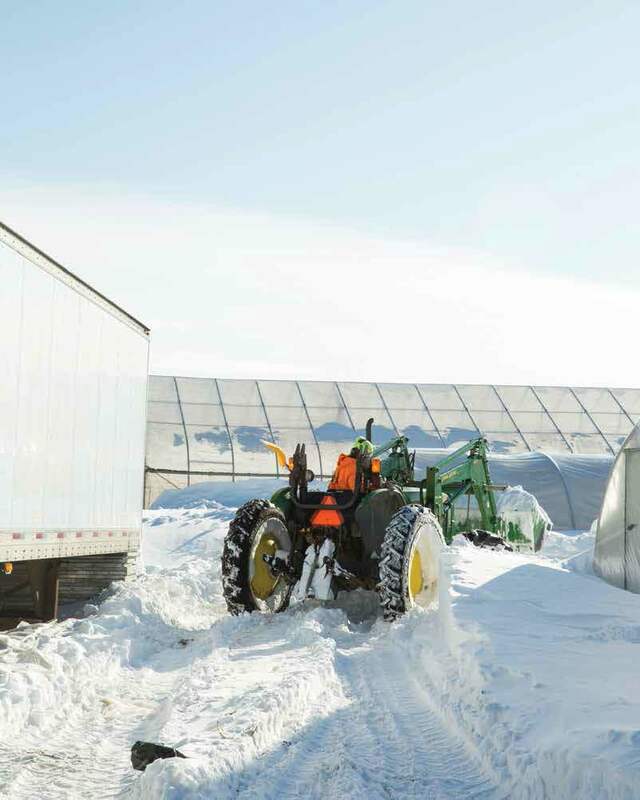 Four-season farming is still new here and there are plenty of challenges: short days and frigid temperatures, mastering the intricate temporal choreography of using moveable high tunnels, marketing, and the sheer physical rigors of farming in winter, to name a few. But checking in with farmers growing crops in winter offers an intriguing glimpse of the possibilities. Welcome to the growing edge of sustainable agriculture in Maine. Kelsey Herrington and Dominic Pascarelli discovered their shared passion for farming as graduate students at Clark University. Pascarelli helped organize theuniversity’s composting system and mentored youth in an urban gardening program, and Herrington studied sustainable meat production on a local farm. After earning their master’s degrees in environmental science and policy, they apprenticed at a farm in Vermont and then Paul and Sandy Arnold’s Pleasant Valley Farm in Upstate New York, where they learned four-season farming, and got “hooked” right away. Looking to start a year-round organic farm of their own, they began farming on land Pascarelli’s parents own in Durham in 2011 and relocated their Two Farmers Farm to ten acres of leased land in Scarborough in 2013. Smack dab between Route One and the Scarborough Marsh, they grow more than fifty certified organic crops on about 2.5 acres, including three 96-foot-long solar high tunnels filled with flourishing winter greens. A blustery afternoon in late fall finds Herrington and Pascarelli buttoning up tunnels bursting with luxuriant beds of rainbow chard, lettuce, mustard greens, and other cold-hardy crops. They’ll harvest them weekly through most of the winter to sell at farmers markets in Saco, Brunswick and southern New Hampshire, and a few restaurants in Greater Portland. Two Farmers’ dazzling winter beds make what they do look deceptively easy, but, of course, it isn’t. Winter crops in unheated tunnels must be covered every cold night or they’ll freeze, and uncovered to maximize light and stimulate growth later in the winter when the days lengthen. Then there is harvesting—on one’s knees for hours cutting tiny leaves with a knife in finger-stinging cold, not to mention meticulous washing and packaging. On top of the intense labor of farming are the challenges of running any small business: marketing, sales, budgeting, accounting, and myriad other tasks. The two farmers are quick to point out that they had help in getting started. Affordable grants from Slow Money Maine assisted with start-up costs for the tunnels. Pascarelli’s contractor father and a friend helped build the tunnels, his mother helps wash and pack produce, and the original farmer who connected them with the landowner did the heavy tractor work. Other farmers pitched in as well. New Leaf Farm in Durham grew their first seedlings, and Six River Farm founders Nate Drummond and Gabrielle Gosselin of Bowdoinham mentored Herrington and Pascarelli through MOFGA’s Journeyperson Program, which pairs new farmers with established ones. Drummond and Gosselin apprenticed a few years before Herrington and Pascarelli at Pleasant Valley, where the Arnolds introduced the young farmers. Through Maine Farmland Trust’s FarmLink Program, which connects prospective farmers with available land, Drummond and Gosselin leased 25 acres of land in Bowdoinham, where they started Six River Farm in 2007. They began winter farming in 2010, and now grow about a dozen winter crops in ten unheated tunnels totaling 21,120 square feet, or just under a half-acre. These crops represent about a third of their winter offerings, which also include storage crops such as potatoes, cabbage and winter squash. Winter farming also helps Six River retain employees—all seven of whom are staying on to work at the farm this year. “All of our farm crew lives locally, and work in the winter—when there are few other employment options—is important to them,” Drummond says. He adds that the opportunity to work year-round means that many crew members stay at Six River for several years. “It’s invaluable to have an experienced, hard-working crew when the farm reaches its busiest season in the summer,” Drummond says. Dominic Pascarelli of Two Farmer Farm in Scarborough harvests kale in a winter hoop house heated only by the sun. Kelsey Herrington, Pascarelli's partner at Two Farmers and in life, makes notes at a desk improvised from a tailgate. Two Farmers sells organic spinach and other greens at winter farmers markets in southern maine and New Hampshire. Farm workers at Six River Farm in Bowdoinham plow snow. While the farmers at Six River and Two Farmers raise all of their winter crops in high tunnels warmed only by the sun, other Maine growers add supplemental heat to boost winter production. Using conventional and alternative fuels and heating systems, they are constantly experimenting, evolving techniques and growing the potential of year-round farming in Maine. Lisa and Ralph Turner started Laughing Stock Farm in Freeport in 1997 with surplus produce from their home garden and greenhouse, where they were inspired to grow cold-hardy crops after reading one of Eliot Coleman’s books. They now manage 15 acres, including 12 acres of organic vegetables and six hoop houses, with total winter production covering about a third of an acre. The Turners have about 250 members in their summer CSA and about 110 members in their twice-a-month winter CSA, and they also sell to local restaurants and retail outlets. The bounty of their farm inspired Lisa to write The Eat Local Cookbook: Seasonal Recipes from a Maine Farm. On a cloudy December afternoon, Lisa Turner tromps across her snowy driveway in flowered rubber boots and rolls up the metal door to a greenhouse. Follow her inside and you find yourself transported to spring. Verdant rows of mesclun and scallions, two of the winter crops the Turners grow, glow in the afternoon light, along with arugula, lettuce, bok choi, hakurei turnips, radishes, baby spinach and kale and cilantro. Redolent of fresh earth and plant life, the air is moist and much warmer than outdoors. The Turners decided to use supplemental heat to promote faster growth and raise more crops in less space at Laughing Stock, where winter growing generates about one sixth of the farm income. Ralph, a mechanical engineer, pioneered a technique to heat Laughing Stock’s greenhouses with used cooking oil and animal fat that he collected from Freeport restaurants. For about ten years, the Turners used this fuel for about 80 percent of their greenhouse heating needs, with the other 20 percent coming from propane. A bumblebee pings against the plastic walls of the greenhouse and a fine, light snow begins to fall outside. Lisa Turner reflects on the ups and downs of growing Laughing Stock Farm, which employs two year-round and six seasonal workers. The Turners clearly are succeeding: they received the 2014 Commissioner’s Distinguished Service Award from the Maine Department of Agriculture, Conservation and Forestry. “The puzzle of how to do this and make a living is actually fun,” she says. lettuce and kale seedlings thrive in a winter hoop house. Laughing Stock Farm was among the stops on a 2014 Maine Farm Bureau tour of year-round growers, along with Olivia’s Garden, a hydroponic outfit in New Gloucester, and Cozy Acres Greenhouses in North Yarmouth. Cozy Acres co-owner Jeff Marstaller is happy to show visitors his brainchild: a new “zero-emissions” greenhouse heated with geothermal energy and powered by solar electricity. in 1995. His research and project planning netted more than $80,000 in grants from a combination of Maine’s Farms for the Future Program, the USDA’s Rural Energy for America Program, and the Natural Resources Conservation Service’s Environmental Quality Incentives Program. The 18-month project was completed in December, 2013: a 96 x 30 polycarbonate and acrylic greenhouse heated by a 10-ton geothermal system powered with 102 solar panels. In its first year of operation, the solar panels generated about 39,000 kilowatt hours of electricity—less than the system used—and the geothermal heating system kept temperatures above freezing on the coldest nights, and hit 55 to 65 degrees during the day. The Marstallers grew lettuce to test their new system and have since switched to organic microgreens, which have a short growing cycle that lets them stay ahead of aphids. On a December afternoon, the only sound in the greenhouse is thesnip of scissors as the Marstellers harvest fresh microgreens—a mix of tiny beet, arugula, and lettuce seedlings. They sell to a handful of local restaurants and retailers and hope to develop a larger local market for their baby greens, which meld earthy-tangy-sweet-flavors. In addition to using their new greenhouse to grow microgreens ten months of the year, they will also use it for some of their wholesale seedling business in spring. While the final price tag for the project is admittedly high—more than $200,000—Marstaller says that the grants and tax savings and credits help offset more than 50 percent of costs. He thinks the new greenhouse will add value to the Cozy Acres brand and his property. 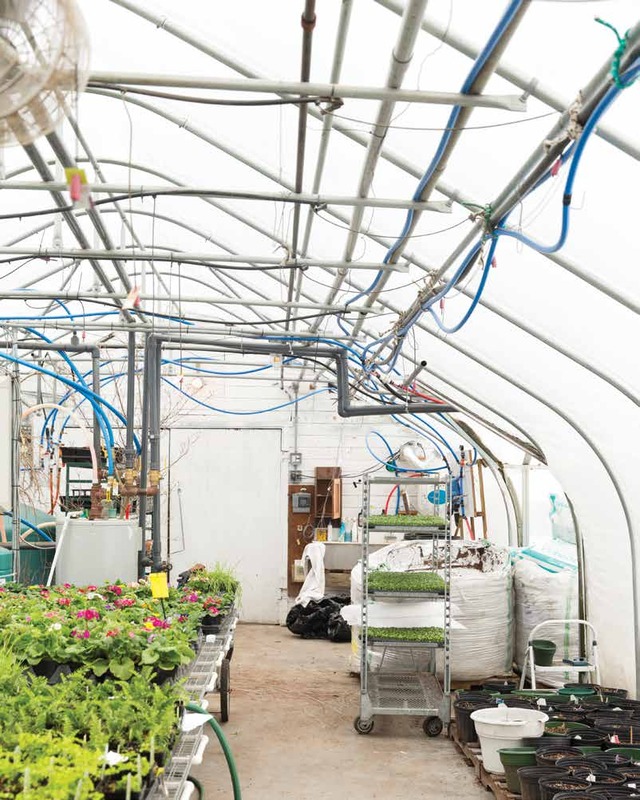 “To the best of our knowledge, this is the only heated yearround greenhouse this far north that is totally powered with zero-emission sources,” he says. Jeff Marstaller of Cozy Acres Greenhouses in North Yarmouth weighs microgreens, a mix of tiny beet, lettuce and arugula seedlings, for delivery to Portland area restaurants. Potted flowers for the wholesale market and microgreens ready for harvest flourish at Cozy Acres. One of the many interesting things Coleman is doing is experimenting with ways to keep high tunnels warmer on the coldest nights without using costly supplemental heat. This year, he’ll be testing Solawrap, a greenhouse plastic that resembles bubble wrap and is a better insulator than sheet plastic. Used in Europe for 30 years, it’s newly available in the U.S. and Coleman will evaluate how well it performs in Maine’s frigid winters. At the same time, he will test a new system to insulate the north wall of a greenhouse with vertical plastic tubes of water heated by the sun. High tunnels are springing up all over the state, some through a USDA Natural Resources Conservation Service cost-sharing program, but growing winter crops in them is still a tricky business. Through Four Season Farm Consulting, Clara Coleman—Eliot Coleman’s daughter—aims to help a new generation of year-round farmers succeed. In one project, she is partnering with Maine Farmland Trust to provide free consulting services to farmers associated with the new Unity Food Hub, slated to open this spring. The goal, she says, “is to have many of the farmers supplying the hub with fresh produce year-round. ”Coleman, who moved back to Maine after running her own successful year-round organic vegetable farm in Colorado, is among observers who see significant potential for the growth of four-season farming in her home state. She notes growing demand from institutions such as hospital and schools, as well as larger grocers and nearby markets in Boston, all of which would allow year-round farmers to expand into markets beyond Maine. It remains to be seen how year-round farming will grow and evolve in Maine, but there are abundant good reasons for pursuing it, from crop failures due to droughts and floods in farming areas out West, to fluctuating fuel costs, to food safety, to supporting Maine’s local farmers, to the vast difference in flavor and quality between local produce and vegetables shipped thousands of miles. And, of course, it’s also common sense.